Here is a desi twist to the famous Italian dish – pasta cooked in Indian style chana masala. Very easy to make with everyday ingredients and is bound to be a hit with the children. Cook the pasta with required water and little salt. Drain off the excess water in strainer. Soak the chickpeas overnight and cook in pressure cooker for 5 to 6 whistles. Drain and reserve the excess water. Add oil and temper with cumin seeds. Add the chopped garlic and cook till nice aroma. Add the sliced onion, green chillies and cook till the onions turn soft. Add the pasta sauce, red chilli powder, chana masala powder, salt and mix well. Fry the powders until raw smell disappears. Add the cooked channa with 2 tblsp of reserved water. Allow it to cook for a while. When a gravy consistency is formed, add the cooked pasta’s and toss them well. Mix until all the spice powders are coated well with pasta. Crush the kasoori methi leaves and add them and mix well. Cook for a while in low flame. 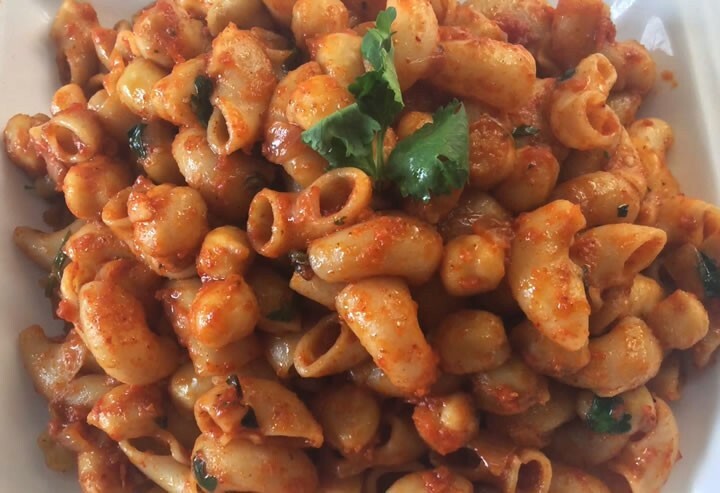 Feel free to comment or share your thoughts on this Chana Masala Pasta Recipe from Awesome Cuisine.